Jack L. Warner was the last of the classic movie moguls. After selling the family business in the late Sixties, he decided in 1971, at age 79, to get back into the game as an independent producer. Jack L. Warner Productions released two films through Columbia Pictures in 1972. The better known of the two is 1776, a musical consistent with Warner's late-career proclivities, which had resulted in My Fair Lady and Camelot. For his other picture he took inspiration from a Warner Bros. release with which he'd had a conflicted relationship at the end of his tenure: Bonnie & Clyde. Overcoming some revulsion at the material, he greenlighted the film and later happily took credit at its surprise success. A western script by two ad-agency auteurs reminded him of that success, so he joined forces with their agency to produce the script by Stan Dragoti and Charles Moss, to be directed by Dragoti, who had heretofore directed commercials. So far s'okay: Dirty Little Billy is a typical film of its moment in movie history, being a revisionist western. But a revisionist western about Billy the Kid begs the question: what exactly are you revising? There had already been quite a few cinematic Bonneys, ranging from the laughing young outlaw played by John Mack Brown in King Vidor's early talkie to Jane Russell's stud in The Outlaw to Paul Newman's "psychological" interpretation in Arthur Penn's The Left-Handed Gun to the monster-fighting hero of Billy the Kid vs. Dracula. But if one thing was consistent, it was that Billy was, if not a hero, at least a protagonist, a compelling figure whose fate is worthy of our attention. It was, to say the least, an unorthodox promotional strategy to suggest, as the Dirty Little Billy advertising did, that he was no such thing. Well, they promised "a different kind of movie," and it is that, if nothing else. As if striving to be the definitive revisionist western of the Seventies, Dirty Little Billy opens with a close-up of mud. That sets the tone as well as anything, since Dragoti and his production team take the bold idea that the Old West wasn't the tidiest place to almost self-parodic extremes. Our setting is Coffeyville, a struggling municipality aspiring to "third-class city" status and with a leg up in its competition with a neighboring community beset with an epidemic. Into this striving town comes Billy with his Ma and his mean old stepfather, who has taken them from the big city to live out his dream of drudgery on the farm. Billy is rebellious before the family gets off the train, and losing his shoe in the mud doesn't help his mood. We may as well note now that Warner had cast a Bonnie & Clyde alumnus as Billy, but rather than Warren Beatty or Gene Hackman it is Michael J. Pollard. It might have occurred to the old man that giving Pollard the lead in any picture would be like giving Elisha Cook Jr. top billing after The Maltese Falcon, but to be fair to Warner he was not the first to think that in Pollard a star had been born. This was, after all, the age of stars without glamour, as Little Fauss & Big Halsey attested by making Pollard and Robert Redford equals. The problem with Pollard, compared to those briefly considered his peers, was that he seemed to be a one-trick pony, capable of but one character type: a moron. At most he might be deceptively moronic-looking, but such a variation was unlikely to enhance his charisma. The perverse point of Dragoti's project, however, seems to be to show that Billy the Kid had no charisma, or much intelligence. The point is made, but it never sharpens to the point of satire as it would seem to need to in order to hold our interest. Back to the story: resentful of a lad who refuses to recognize him as a father and proves an incompetent farmer, stepdad persuades Billy to run away, but the kid is barely out of town when he hops off the train and heads back. After dodging bullets in the mud, he falls in with Goldie (Richard Evans), a one-whore pimp who has just stabbed a patron of the saloon where his girl Berle (Lee Purcell) plies her trade. Billy becomes a bystander to Goldie and Berle's abusive, codependent relationship and learns the use of a pistol. It does him little good at first, as the weapon misfires when he tries to intervene in a fight between Goldie and a refugee from the rival town, which has folded due to disease. The brawl devolves into a nasty knife fight between Berle and one of the refugee girls, Berle prevailing when she slices her antagonist's ear off. This latest violence is the last straw for the leading citizens of Coffeyville, who try to warn Goldie out of town with the threat of a famous marshal. The threat works, but the leading citizens fail to honor their end of the bargain, setting Goldie up for assassination as he rides away. Berle dies trying to save him, but Billy manages to get the wounded Goldie to temporary safety. Our Kid comes of age in an outlaw mining camp where Goldie has foolishly taken them, thinking some magic name will make the hardcases there his friends. At the brink of death, if not worse than death, Billy miraculously acquires legendary skill with his pistol, saving Goldie again and annihilating the miners. Here seems to be the moment when the student surpasses the master, and some decisive change in their relationship, if not a decisive end to it, seems to be in order. Instead, Goldie complements Billy on doing good, Billy appears pleased, and the film ends. Perhaps that struck Warner as avant-garde. What Warner apparently failed to get about Bonnie & Clyde, and thus failed to include in Dirty Little Billy, is a sense of transgressive fun to cinematic outlawry. Instead, the Dragoti film is a pageant of unrelieved wretchedness which is fascinating in its own way to a student of revisionist westerns but unlikely to entertain general audiences. It's remarkable that a classic mogul like Warner would make the last film people saw his name on -- produced before 1776, it played many markets in 1973, after the musical had opened -- such a nihilistic piece of work. In a sense he proved that he remained a contemporary filmmaker to the end, considering that Dirty Little Billy was far from the only "revisionist" film in any genre that now seems to dare us to find it entertaining. Stan Dragoti, meanwhile, wouldn't make another film until the end of the decade, but by that time he had found a more constructive, or at least a more appealing alternative approach to a legendary figure. That film was Love at First Bite. The latest film from the director of the acclaimed one-take stunt film Russian Ark has something in common with that perennial candidate for Worst Film of All Time, Manos: The Hands of Fate: an pathetically diabolical actor with grotesquely stuffed trousers. Happily, the resemblance ends there, unless you feel let down by Alexander Sokurov's refusal to show us a war in heaven or the more spectacular episodes of the Faust legend. He's freely adapted Goethe's famous verse play -- with my poor high-school German I still recognized some of the poet's original lines in the film -- but treats the legend as an epilogue (or prequel) to a trilogy of films about 20th century tyrants: Moloch (Hitler), Taurus (Lenin) and The Sun (Hirohito). We are invited to see in Heinrich Faust a precursor of their destructive will to power, and to make him a more immediate ancestor Sokurov has updated the legend to Goethe's own time, the early 19th century. 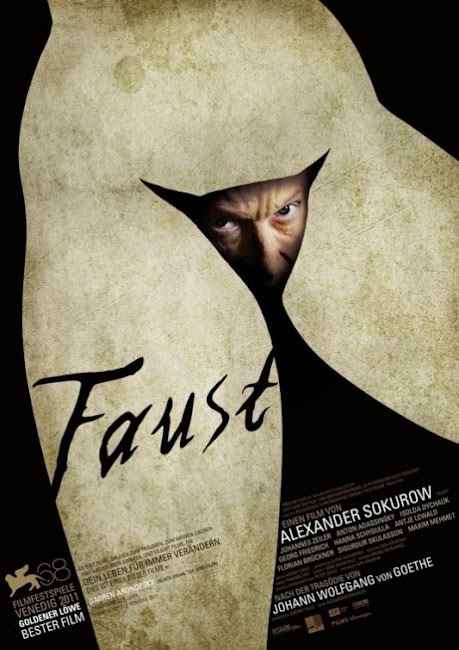 Making a German Faust film he couldn't help but tread on F. W. Murnau's territory but Sokurov's Faust is more reminiscent of Murnau's Nosferatu, while the setting and the mania that drives both Faust and his deranged assistant Wagner are reminiscent as much of Werner Herzog as of Murnau. The film may be as much a riff on German cinema as a riff on German culture and history. Sokurov sticks to the first part of Goethe's play, which is fine since Goethe himself didn't get around to part two until almost the end of his life. This leaves us in a mundane setting in which Faust (Johannes Zeiler) and Wagner (Georg Friderich) go about their archetypal quest for knowledge by dissecting cadavers. Wagner is creepy from the start and gets creepier later. The ever-frustrated Faust falls in with Mauricius the moneylender (Anton Adasinsky), Sokurov's Mephistopholes. In a great performance, Adasinsky sets the tone for the film. Mauricius is a petty if not pathetic devil -- the bulges in his clothes suggest that his angelic and demonic physical attributes have been stuffed inside his own grotesquely gnarled flesh. As a moneylender, he's often busy collecting on debts in this world, and in that role he's more hated than feared. He makes the traditional promises to Faust, and Sokurov mystifies the proceedings enough with distorted lenses to indicate that Mauricius can back up his claims. Faust isn't sure what he wants from this strange man until he encounters Gretchen (Isolda Dychauk) in a public bath where Mauricius makes a ridiculous spectacle of himself by stripping and flirting with the other girls. As Faust's desire for Gretchen grows, Wagner grows madly jealous, while Gretchen takes interest in Faust, despite his apparent involvement in her brother's death in a pub brawl, as a form of rebellion against a controlling mother. The story follows the barest bones of Goethe's outline, though Sokurov doesn't follow Gretchen's storyline to its melodramatic climax. Indeed, the way he ends the film is a stunning statement of, if not his own than Faust's indifference to the moral stakes involved in his dealing with the devil. Like just about everyone else in the picture, the doctor has treated Mauricius with scorn during their walks through town and countryside. After the moneylender finally entices him to sign the infamous pact with blood, and Faust has his night with Gretchen, Mauricius seeks to recruit Faust into some infernal army, giving him armor to put on while donning some himself for a trek into a wild landscape that might be Hell. The armor soon grows uncomfortable and ridiculous for both travelers. More unexpectedly, Mauricius is increasingly uncomfortable with the environment itself, while Faust is increasingly fascinated. For the devil this is, presumably, both his domain and his punishment, while for the man it's just a new world to conquer by gaining knowledge of it. A geyser terrifies Mauricius while Faust adores it until it bores him with its repetition. Impatient and uncomfortable, Mauricius demands Faust's soul, but the doctor tells the devil to wait until he's dead -- and if he won't wait Faust is happy to stone the helpless, wailing moneylender until he's buried under rocks, leaving our antihero free to explore this wonderful, terrible new world. Repulsive as Mauricius is, you may find yourself feeling sympathy for the devil, for rarely has his work been shown to be more thankless, even when he seems to be winning. If Mauricius is a rebel angel of myth his punishment seems to be an inability to enjoy whatever power he gains over men. In town, he's plagued by a woman who claims to be his wife, while Faust, as a contemptuous ingrate, may be typical of what our mediocre Mephistopheles has to deal with in his real work. It's an interesting take on the devil, but where does that leave Faust in Sokurov's scheme of things? If he wants us to link Faust with his historical subjects from the next century, the thing in common must be a certain arrogant fearlessness or an indifference to consequences -- or a failure to take his own soul seriously. Faust may leave you wondering what the ultimate point is, but it's a beautiful thing to ponder. Bruno Delbonnel's cinematography -- he's since worked with the Coen brothers brilliantly on Inside Llewyn Davis -- will put you in mind not just of Murnau and Herzog but of the paintings, contemporary with Goethe, of Caspar David Friedrich. Visually the picture is as much a masterful accomplishment for Sokurov as Russian Ark was, and the acting lives up to the images. Zeiler is great in the title role, but Georg Friedrich as Wagner nearly steals the film with a Kinskian tirade in which he demands to be called "the great Wagner," tries to convince Gretchen that he's really Faust, and shows her a homunculus -- a disembodied face, really -- he made all by himself to impress her. I must admit that I don't entirely get Sokurov's philosophical or spiritual points, but on a mere movie level Faust is a feast of elegant madness that can be enjoyed on that level -- depending on your taste, or your morals. William Wellman's film introduces us to an ambitious, crusading journalist who's working on an expose of a milk racket. The public may not care about bootlegging and other crimes, but the writer surmises that they'll care if they learn that gangsters are forcing up the price of milk through extortion and other measures. This would-be hero has the ear of his editor and wants the help of his paper's star gossip columnist, Jimmy Russell, who has a lot of underworld connections. Jimmy thinks the story's too dangerous, however, and his caution convinces the editor to kill it. Jimmy (Douglas Fairbanks Jr) is the hero of our story, so you can probably guess where this is going -- but since this is Pre-Code Cinema, you're probably wrong. Jimmy never does expose the milk racket, while the crusader is never shown to be other than what he seems to Jimmy: a reckless fool. He's dumb enough to call his city desk from inside a "speako" owned by head racketeer Eddie Shaw (Lyle Talbot), without realizing that one of Eddie's men is listening in upstairs. Since the crusader is still trying to get Jimmy involved in the story and mentions his name on the line, Eddie sends his head goon, the practical-joking bully Bernie (Warren Hymer) to Jimmy's apartment. Hard-boiled Jimmy isn't scared, or doesn't show it if he is, but he seems genuinely annoyed when Bernie explains why he's there and what the crusader is up to. He calls the pressroom and kills the milk-racket story -- Jimmy has Walter Winchell-like popularity and authority -- and Bernie in turn calls his men to call off a hit on the crusader. That's how things are done in the big city. Crime isn't Jimmy's business and he keeps it out of his column. He goes along to get along and really feels no regrets about it. Nor do the filmmakers expect anyone in the audience to share the crusaders' outrage over the milk racket. This is a comedy, after all -- I think. The irony of Love is a Racket is that love is the racket that destroys Eddie Shaw. He has the hots for Mary Wodehouse (Frances Dee), the daughter and granddaughter of showgirls and Jimmy Russell's girlfriend. Mary loves Jimmy in spite of the skepticism of her grandma (Cecil "yes, it's a woman" Cunningham), an original Floradora girl, who doubts the reporter's moneymaking potential despite his rather impressive apartment. Still, Jimmy can prove useful, since he devotes his column to promoting Mary's career and hopes to land her a role in the newest production of big-time showman Max Boncur. Unfortunately, Mary is sort of living on spec and has written a number of bad checks. This is the sort of thing that gets people blackmailed, and who should end up with the bad checks but Eddie Shaw? Luring Jimmy out of town by planting a false item that he's gone to Atlantic City, Eddie expects Mary to come to his penthouse and make some sort of deal to get the bad checks back. In Atlantic City, Jimmy blunders into Eddie's trap and becomes Bernie's prisoner. Bernie is irked because he'd bet Eddie fifty bucks that no one would fall for such an obvious plant, and he takes it out on Jimmy by giving him hotfoots and setting his newspaper on fire. But Bernie gets too involved in his gags to keep Jimmy covered properly and the columnist makes his escape to set up the picture's climactic set piece. Jimmy knows that Eddie has the checks and heads for the penthouse through a signature Wellman rainstorm. Reaching the roof, he hears gunshots, then sees a figure -- it's Mary's grandma -- dart out and dump a gun in the shrubbery before exiting. Jimmy enters the apartment to find Eddie dead. Wellman learned something about soundtrack counterpoint in The Public Enemy, when he played "I'm Forever Blowing Bubbles" on a record as Cagney's corpse is delivered to his ma, and he does something similar here. A radio broadcast from a jazz club plays as Jimmy discovers Eddie's body. "The show continues!" the announcer says between tunes. Realizing what's happened and its implications for Mary's future, Jimmy decides to cover up for the grandma. He pours whisky and disarranges furniture to make it look like Eddie had gone blind drunk. Then, after patting down some shrubbery, he drags Eddie's body out to hurl it down to the street. At this point, Jimmy's pal Stanley (Lee Tracy), a reporter for another paper, has shown up. Not knowing about the grandmother, he sees Jimmy lugging and dumping the corpse -- Wellman sends a dummy down and suggests the impact by showing a single shoe landing some distance from the rest of Eddie -- and draws his own conclusions. Lingering after Jimmy leaves, he also sees that Jimmy has left implicating evidence behind, but collects it to protect his friend. That's what reporters do for each other. It's really a tragedy played as farce the first time around. Returning to the penthouse to report on Eddie's death, and not realizing what Stanley has done for him, Jimmy has a panicky moment when the cops discover a newspaper -- he had carried one with a damning phone number written on it -- and remark on their interesting discovery. It turns out to be a glamour-gal photo on the front page. The cops, being Pre-Code cops, are quite convinced that Eddie died accidentally and no one, presumably, is interested in autopsying Eddie's remains. Only after Jimmy is in the clear does Stanley give him back his own newspaper and tell what he thinks he knows. Naturally, to protect his prospective in-laws Jimmy doesn't set Stanley straight. If all of this hasn't convinced you that love is a racket, the reporters return to Jimmy's pad with galpal Sally (Ann Dvorak), only to receive a telegram -- Jimmy fears worse when the buzzer rings -- announcing Mary Wodehouse's wedding to Max Boncur. This news inspires a tirade in which Jimmy states the theme and title of the picture and vows to get out of this particular racket for good, only to be stopped short when he finally sees in Sally's eyes what we and Stanley have seen all along. Jimmy doesn't exactly capitulate immediately, but his closing acknowledgment of Sally as "you racketeer" has a here-we-go-again tone that suggests a sequel we'll never see. A case can be made for Fairbanks Jr. as a definitive male Pre-Code star if only because his Pre-Code persona is so different from the swashbuckling star, his father's son in effect, that classic movie fans actually remember. He's a revelation practically every time I see him, and I've come to like his youthful streetwise self, the one who sounds more Noo Yawk than English, better than his sometimes campier swashbuckling self, who seems a sort of surrender to his heritage after some success creating a distinctive persona that would suddenly be forgotten. Alongside Fairbanks the then fast-rising Lee Tracy is little more than a stooge as Stanley, a character who, depending on how you look at it, is pining for Jimmy from afar as much as Sally is. Fairbanks is really playing the sort of character Tracy would specialize in at his peak of stardom, and this is the rare Pre-Code in which Tracy isn't the most charismatically amoral character on screen. Junior fits the role quite nicely, and his arc of worldy-wise cynic made stupid and reckless by love makes Love is a Racket work, in a modest way, as a somewhat dark comedy, if also a relative trifle in Wellman's torrent of filmmaking at the time. "It must be obvious that that slaughter of the firstborn of Egypt wasn't the work of the universal Power we are beginning today to recognize as the source and ruler of all life. The real God wouldn't go in for wholesale murder of his creations and bring mourning into thousands of homes just to let a horde of Israelites loose to go and do more wholesale slaughter in their promised land. Oh, no! "By belief in their Jahveh, the collective belief of many thousands of people, and by sacrifices to him, these same Israelites created an actual Jahveh and gave him tremendous power. And you'll find lots of tales in the Old Testament of how the said Jahveh got angry and ran amok, as long as their collective belief and continual sacrifices kept him strong enough for manifestations." The serial's premise is that the Egyptian cat-god Sekhmet is kept alive by the worship and sacrifices not just of the mysterious vamp Cleo Kefrah, but by those of a more mysterious, more malevolent other. It's taken three chapters for the plot to really come together but Mann's story may yet redeem its deadly-dull opening chapters. The stand-alone stories are this week's real highlights. Philip Ketchum's "The Valiant Arm," the latest in his Bretwalda series about the axe linked to the destiny of England, has more than normal interest because it pits the latest wielder of the axe against none other than William "Braveheart" Wallace. It will surprise readers who know the Wallace story only through the Mel Gibson movie first to learn the truth about the Battle of Sterling -- it was a turkey shoot, the Brits picked off as they crossed a bridge -- and then by Ketchum's neutrality between the Scots and the English. His King Edwards isn't the monster of Gibson's film but really a generic monarch, neither good nor wicked, who happens to have an evil advisor, the story's real heavy, who plays Edward (never called "Longshanks") and Wallace against each other in hopes of winning Scotland for himself. Wallace himself is portrayed as a kind of romantic hero or antihero, first encountered in disguise as a blind minstrel who helps the hero early and more unexpectedly later. Ketchum weaves a web of what-might-have-been by introducing a heroine whom the villain hopes to pass off as the "Maid of Norway," an heir to the Scots throne thought dead, and who turns out to be that very person, one who could pacify Scotland and end the war if she didn't prefer her obscurity and our hero's company. Ketchum can't change history, after all. "The Kiss of the Cobra" is Walter C. Brown's latest Chinatown story. As readers may recall, Argosy has two Chinatown specialists: Brown and Arden X. Pangborn, who writes the Wong Soo stories. Here's the difference: Pangborn writes conventional mystery stories about a small-scale Charlie Chan, an informal Oriental troubleshooter in his neighborhood. Brown, I think, gets closer to the transgressive appeal of the Chinatown genre, because he almost always writes about oppressed underdogs who get away with murder while leaving white cops baffled. He does it again here, as his underdog hero takes up a cop's unwitting suggestion that a pet cobra could be used against an oppressor. The hero figures out an alibi for his snake all by himself, and is safely off to China, albeit to fight the Japs, before the dumb cops are any wiser. While pulp Chinatown has the allure of sheer difference, its lasting appeal must have something to do with the idea that normal American rules don't apply there, yet some sort of justice is served. They're some of the most fascinating, if sometimes also the most repellent stuff you can read in pulps. Donald Barr Chidsey returns with the novelet "Flaming Acres," the prolific pulpster's most outrageous story yet during our survey. At least it's outrageous by our 21st standards the way the movie Reefer Madness is. In this one an abandoned real estate project is used as a hideout for gangsters growing "Muggles ... Grifo, mari, moota" -- marihuana! It is known in Africa as Cannabis Sativa, colloquially dogga, choras, Leainba, or, in Morocco, schira. Cannabis Indica, or Indian hemp, comes sometimes in the form of bhang ("cementer of friendship"), a coarse powder; sometimes as gunja ("the laugh mover") in little bundles like tobacco. The Arabic name is hasheesh. There is also a Cannabis Americana. The three kinds are essentially the same; yet such is the enchantment distance lends, that people who speak with bated breath of the fabled exotic hasheesh sniff and shrug at the mention of marihuana, which for all they know may be growing right in their own backyard. For it's a weed. It is not tropical or sub-tropical. It does not demand mountain air or desert aridity. In fact it is not fussy at all, requiring no fertilizer. It will grow practically anywhere. It seeds itself, spreads, multiplies. It is no fancy cultivated growth like the poppy of the erythroxylon coca. It doesn't any more care where it springs than it carew whom it kills. If its principal name happens to be Mexican, this does not cause it to feel any respect for the international boundary. It does at least as much damage north of the Rio Grande as south of that stream. It grows wild. It grows along railroad tracks and in vacant lots. Oh, it's a weed; though unlike most weeds it is not merely ugly but dangerous as well. A pudgy thing with a charlotte russe face bobbed smirkingly. It was about twenty years old and looked as though a breath of fresh air would kill it. "Come in, buddy! Come in! You want a smoke?" There were four other critters besides this worm, three of them horizontal, two completely out of the picture. One dragged very slowly at a cigarette as though it hurt him. He stared at the ceiling. But the upright one was chockful of animation. He drummed his fingers on the table at which he sat, chuckled and sang. When he saw Fred he counced up and down happily. "Oh goody-goody! Company! [...] Sit down, sweetheart, and I'll buy you a pill. How'd you cut your head? Ta-ta-ti-ta! Look, you take the two low parts and I'll take the high parts and I'll be in Scotland before you. I'll do the orchestra accompaniment besides. All set? It's the quartet from Rigoletto. At least I think that's what it is. You'll recognize it anyway, once we get started." Add to all this a dramatic scene in which the hero is buried alive in a truckload of pot plants and Flaming Acres is right! From the vantage of 75 years later Chidsey's story may be more camp than pulp, but it's bound to entertain one way or the other. Rounding out the issue is "Crying Hound," a hunting story by Jim Kjelgaard, and Richard Sale's short story "Benefit Performance." Following closely after Sale's railroad ghost story, you expect something similarly Twilight Zoney when a superannuated Civil War veteran has a mental breakdown after his great-grandson jokingly accuses him of assassinating Abraham Lincoln. Old Abe himself appears before the old man's deathbed to set the record straight, but Sale turns the tables by showing us that Abe is just an actor hired by concerned relatives to reassure the veteran, and that the oldtimer knew this all along. It's a cute note to close on for this week. I'll have to skip another week simply because I don't have access to the August 26 issue, but this feature will return the following week with yet another Richard Sale story, an E. Hoffman Price tale of the Ethiopian resistance and plenty more where those came from. The decade's new standard for martial arts movies was set by a police thriller combining Indonesian performers and a Welsh director. Gareth Evans's Raid is the sort of action movie that may compel some American viewers to suspend disbelief as it segues from conventional cop action to martial arts mayhem. Where did the guns go? There's plenty of shooting early, but as the raiding cops, having no hope of backup and actually set up, fight their way up a tenement tower, practically a panopticon of peril, to the lair of crime lord Tama, we go from guns to machetes and finally to feet and bare hands. The transition is nearly seamless if you know what you're getting into, but Evans, who writes as well as directs, overplays his hand just a little when he has Mad Dog, one of Tama's sub-bosses, make a speech about how much more he enjoys beating people to death with his hands than he enjoys shooting or stabbing them. All pretense of urban realism falls away in that moment and The Raid stands revealed as pure pulp fiction. Anyway, Indonesia probably isn't as much of a gun culture as the U.S. or some other places. As The Act of Killing ably illustrates, people of the peninsula are often quite inventive about dispatching their enemies. 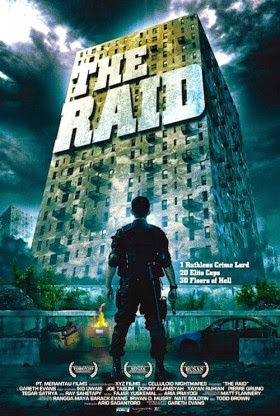 The Raid remains very much a cop film after it shows its true genre colors. Its behind-the-scenes subject is the treacherous politics of policing. The raid's commanding officer, Wahyu, doesn't tell his men until they're already in too deep that they can't expect backup because his is an unauthorized mission, his rogue action to kill or capture Tama. Wahyu's agenda is so close to his vest that he's ready to betray his men to the ultimate extent. Yet he proves a dupe, or so Tama claims when he tells the officer that he'd been tipped off about the raid and invited to kill a troublesome cop, the rest being a bonus. One gets the sense that the Jakarta police are authoritarian, ruthless and corrupt, except for an honest handful, many of whom end up sacrificed to the ambitions or rivalries of higher-ups. I could see an American film on the same subject, except it'd be guns all the way to the top floor. I'm not complaining about The Raid, because the martial arts lived up to the film's already-lofty reputation. The highlight and instant entry in the best-fight-scene-ever sweepstakes is the two-on-one climax pitting the aforementioned Mad Dog (fight co-choreographer Yayan Ruhian) against a surviving cop and another sub-boss who happens to be the cop's brother. Again, Mad Dog takes the story into preposterous pulp territory; he has his erstwhile partner chained and is pummeling him like a heavy bag when the cop shows up. There's a pause while Mad Dog frees his captive, who proves hardly worse for wear, so our villain can test his might against two antagonists. Fastidious Mad Dog even raises the chain back up the ceiling so it won't impede the action or be used unfairly. If that sounds silly in the description, especially when I mention how the brothers wait patiently for him to finish, it's also a brilliant way for Evans to build anticipation for a battle that justifies the wait. For all the all-out mayhem he directs, Evans also proves himself quite good at suspense. He's happy to bring things to a halt after a gangster has plunged his machete repeatedly through a flimsy wall like a magician running his swords through the magic trunk with the girl in it. Our cop hero is behind the wall with a wounded partner and has just had his cheek sliced by that machete when something distracts the criminal. He has to stand there with that blade literally in his face, and he has to make sure somehow that there's no blood to tip off his pursuer when the blade is finally withdrawn. Nicely done. Remarkably, Evans has not yet been assigned a Hollywood tentpole -- the Godzilla people went with a different Gareth -- though he did contribute to last year's portmanteau film V/H/S2. Instead he released The Raid 2 earlier this year and has announced a Raid 3, while an American Raid is reportedly in the works with little if any input from the original director. Evans may simply prefer to work in his adopted homeland, and it's not as if he hasn't made a name for himself worldwide from that base. Watch this space for a review of Raid 2 before the year is out; that should give some idea of whether Evans bears further watching. This is a time of turmoil in the Marvel Cinematic Universe. Next year's Ant-Man is the studio's first publicly troubled production following the departure of director Edgar Wright after he spent years convincing the company to make a movie with the character. For me, the big mystery surrounding this debacle has been why Wright was unable to work with Marvel while the company has just released a film by the director of Super, a particularly irreverent and brutal superhero parody. One difference, reportedly, is that Super's James Gunn is a great pal of Avengers mastermind Joss Whedon. This might mean Gunn could get away with more, but it more likely means Gunn proved more of a team player than Wright. 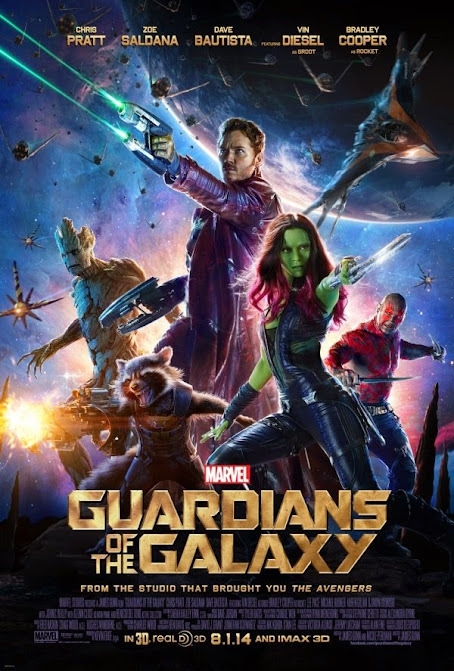 Gunn's Guardians of the Galaxy remains a Marvel movie first and foremost, but it has a split personality, reflecting not so much Gunn's sharing of screenplay chores with Nicole Perlman but a desire by all involved to please multiple audiences at once. It mocks and indugles the tropes of the genre simultaneously. Well, not literally simultaneously, but Guardians is like a movie that had scenes reshot but kept both versions of each scene. It could be accused of satirizing its own sentimentality, but sometimes the scenes are in the wrong order. One of the film's funniest moments comes when Drax the Destroyer (Dave Bautista) declares his friendship for his recent companions as they embark on a likely suicide mission. His soul soars as he turns to each new friend, while his language grows progressively more insulting. You are my friend, he tells Peter "Star-Lord" Quill (Chris Pratt), and the "dumb tree" Groot (voiced minimally by Vin Diesel) is his friend, and this "green whore" Gamorra (Zoe Soldana) is also his friend! Bautista, a professional wrestler who should be the breakout star of this film, nails the moment; he has a knack for deadpan throwaway utterances of absurd things that shows great comic timing on his and Gunn's part. I suspect that Drax is the character closest to Gunn's heart, or to the spirit of Super. Not long afterward, the film lurches toward tearjerking as one character makes the ultimate sacrifice to save the others, and later still it's nearly as treacly when the survivors clasp hands to share the ordeal of containing unimaginable cosmic power. But any perceived inconsistency in tone isn't necessarily contradictory. Most of the audience most likely laughs at Drax's friendship speech and chokes up just as readily later. The sentimental moments are among the film's weakest, starting with the mawkish scene at the deathbed of Peter's mom back in 1988. You can believe that Gunn and/or Perlman can't take these moments seriously, yet recognize their necessity for some in the audience and for their own effort to sell Guardians as a film about Friendship. The great thing about tentpole movies is that you can eat your cake and have it, too. I'll remember Drax's speech and similarly snarky or hard-boiled moments and others will remember this as a rollicking buddy picture. What reconciles these perceptions is the idea that the whole -- the team and the film -- is greater than the sum of its parts. For Marvel, Guardians is a major opening-out of the cinematic universe to begin to encompass the vastness of the comic-book cosmos. Comics fans will recognize many of the names dropped, yet I wonder whether moviegoers will remember the shadowy Thanos (Josh Brolin) as the death-courting figure glimpsed briefly at the end of The Avengers. Here he's like the godfather of cosmic crime, and a wicked stepfather to Gamorra and her evil cyborg sister Nebula (Karen Gillan). Thanos will be a major figure in the third cycle of Marvel movies, or so we presume, but he was actually somewhat of a disappointment in his first real appearance. But this is a rare modern adventure film in which the villains are easily the weakest characters, including Nebula and the immediate antagonist Ronan the Accuser (Lee Pace). None of them has much of a personality beyond blunt malevolence, but since the point of the picture is to put over the personalities of the Guardians it can be forgiven some lackluster villainy. The Guardians do enough bickering among themselves to make up for it. As a result no overarching plotlines are much advanced -- the Collector (Benicio del Toro), introduced at the end of Thor: The Dark World as a seeker after Infinity Stones, is no further along in his quest, while Thanos doesn't seem to have any agenda of his own at the moment. The real work of Guardians, apart from establishing its team, is to make the Marvel cosmos a welcoming place full of humanoid aliens rather than interchangeable reptilian-insectoid hordes. The prevalence of humanoids reminds some viewers of Star Wars but really only makes Guardians an old-school space opera with modern badass elements. Gunn and Perlman avoid the pitfall of trying to explain the cosmos, apart from introducing the concept of the Infinity Stones. Most thankfully, they avoided making Peter Quill a point-of-view character who has to have everything explained to him. The writers most likely realized that audiences don't really need to understand how the whole Marvel universe works, and that they don't really care (any more than the writers) about the fate of the planet Xandar. If anything, Marvel space looks too familiar, Xandar a little too much like Asgard and other places too much like the dark worlds of Thor movies. Rather than impose a tour guide on us, the filmmakers ground or experience with an oldies soundtrack, Peter's "Awesome Mix" casette of Seventies tunes. This itself is a bit of pandering but at least it means that Guardians doesn't sound like every other superhero movie, and it really was cool to see them do their hero march to The Runaways' "Cherry Bomb," even if Gamorra can't repress a yawn. Peter himself is a familiar heroic loser type and not really a strong character, and an inevitable quest to find his father doesn't look promising. He's overshadowed by Drax and even more by Rocket (voiced by Bradley Cooper), a belligerent vivisected "lower animal" who resents the "raccoon" label without even knowing what a raccoon is. Hell, even Groot overshadows the relatively bland Peter and Gamorra with his possibly limitless repertoire of powers and his ability to invest "I am Groot" with as many meanings as a wookie's wail. None of the Guardians is entirely immune to pathos, and sometimes the writers overcompensate, as in a late scene when Rocket and Drax ask the Xandar authorities whether it's okay for them, newly pardoned, to steal and kill respectively. That's one of the few comic scenes in the picture to completely fail, but overall Guardians is the sort of hit-or-miss venture in which activity counts most. When a picture throws so much at you, all the way to the surprise appearance of a former Marvel movie star after the credits, it can stand a lot of misfires and still keep a healthy batting average. While I'm not sure what these guys can do in a second picture, even though the writers already have ideas, I won't mind spending another couple of hours in their raucous company. Labels: 2014, Marvel, sci-fi, U.S. In 1936, someone at Metro-Goldwyn-Mayer looked at their young contract player James Stewart and saw a homicidal maniac. You can see the results of such thinking in After the Thin Man, and you might have seen it here as well, in a project W. S. Van Dyke inherited in 1937 after the sudden death of Richard Boleslawski, had some other producer wanted Stewart for another picture. The gossip columnists reported that poor Stewart had badly wanted the role of Him to whom They Gave a Gun, but that now Metro would seek to cast an unknown. They ended up casting Franchot Tone, not exactly an unknown, and while They Gave Him a Gun might have been a game-changer for Stewart, following so closely after After, it probably made little difference in Tone's career. Still, Tone looks like a better fit for the part than Stewart would have been. He seems innately sicklier, which seems to be what the role of Jimmy Davis requires. Adapted from a novel by sometime writer-director William J. Cowen -- who at one point hoped to direct this himself -- the screenplay combines antiwar attitudes that would soon go out of fashion with pop psychology about crime. In our own time there's a temptation to think of gangsters romantically as warriors, even knights of a sort in their own feudal world, or as superpredators standing above us civilians on the food chain and thus superior in at least a practical way to the rest of us. By contrast, during the Thirties, when figures as diverse as Al Capone and John Dillinger changed the face of crime, it was asserted, as a matter of propaganda if not professional opinion, that the gangster was really a misfit, a loser, inferior mentally and or physically to bourgeois man and thus unsuited to bourgeois work habits. In short, the gangster was nothing without his guns. In its crudest form, this point is illustrated in early superhero comics when Robin the Boy Wonder can take out three or four crooks with his bare hands, after they've been challenged to take him on without their weapons.Gangsters were less than nothing, in fact, but actually outright cowards without their guns. Jimmy Davis, as imagined by the screenwriters if not the novelist, demonstrates this thesis. A mild mannered draftee during the Great War, he faints at the prospect merely of sticking his bayonet into a practice dummy during basic training. Someone like this, the film says, has no business fighting a war, yet he was taken by conscription and sent to Europe, where his buddy the carny barker Fred Willis (Spencer Tracy, nearly typecast after Dante's Inferno) looks after him. Jimmy's war is part Full Metal Jacket, part Saving Private Ryan. Like Kubrick's Pvt. Pyle, Jimmy finds that marksmanship is the one thing he's good at, and he starts to feel fond of his weapon. He becomes a super sniper, but before his moment of grace undergoes an ordeal of cowardice. Stumbling upon a dead German while climbing a flight of stairs, Jimmy mistakes the corpse for a live soldier drawing a bead on him and instantly surrenders. Realizing his error, he ascends and finds he has a perfect nest to annihilate an enemy machine gun position. Gleefully he takes the Germans out one by one before his own position is blasted. As Jimmy recovers, the romantic triangle plot kicks in. Jimmy and Fred are fond of the same nurse, the hard-boiled Rose Duffy (Gladys George). She prefers Fred despite giving him a lot of sass and a little physical abuse, but he goes missing during a big offensive while Jimmy's recovering. By the time Fred returns, having been a P.O.W., Jimmy and Rose are engaged. Fred can tell that Rose will dump Jimmy if he says so, but he also sees that Jimmy is too psychologically fragile to stand the loss. It's time for some pathos of renunciation as Fred lies to Rose about a wife and kids at home and earns her hatred for seemingly having strung her along. The film's final lines try to nail it down as an antiwar film. One of the cops hunting Jimmy is his and Fred's old drill instructor, to whom Fred says of Jimmy, "You oughta pin a medal on him. He was your prize pupil." This seems unfair, if only because the soldier/cop hasn't been a big enough character in the story. It may also muddle things, especially to more modern viewers for whom guns alone may suffice to explain Jimmy's tragic career, without bringing the military into it. Moreover, Cowen's original argument seems to have been that the system as a whole, in peace as well as war, deformed Jimmy by turning him into a killing machine only to kick him to the curb when it didn't need killers anymore. By leaving out Jimmy's pre-crime efforts to readjust, the movie makes it look like he made a beeline to crime and makes him look more like a villain than the victim it claims him to be at the end. The movie's real problem is that it needs to be Jimmy's story, but we mostly get Jimmy from Fred's point of view. The fact that Fred emerges from the war unscathed further undermines the closing argument that militarism mutated Jimmy into the monster Fred discovers in civilian life. Above all, the fait accompli that forces us to accept that misfit Jimmy has become a powerful gangster without seeing his ascent is deeply unconvincing, Franchot Tone being no more plausible in this respect than Jimmy Stewart might have been. In simplest terms the movie tries to explain too much and leaves too much unexplained. Since 1937 is still early in the "Code Enforcement" era, the filmmakers may have gone out of their way to steer clear of anything that might have looked like "glorifying" crime while portraying Jimmy's rise to power. Yet They Gave Him a Gun reminds us that the Code Enforcement (or "Classic") era was not a monolithic period of consistent rules. Not long after 1937 no one would have dared suggest that anyone's personality could be warped by the military giving him a gun. From the vantage point of World War II, 1937 looks like a period of relative freedom in movies, however it looks in comparison to Pre-Code Cinema. They Gave Him a Gun may be a failure, but Metro deserves some credit for taking a chance on an ambitious subject. This seems like another order of magnitude from yesterday's news. From Howard Hawks to Lars Von Trier -- put it that way and has anyone had such a career? As Bogart's consort, Bacall has been a legendary figure almost from her start in movies, seventy years ago. Arguably from the instant she appeared in To Have and Have Not she was the coolest woman on film. Her passing leaves us closer to the end of our live ties to Hollywood's classic era. She probably was the most iconic survivor of those days until now. Her filmography isn't huge or deep, but for a while you could believe that everyone knew her, and anyone who saw her and heard her will remember her. And for the hell of it, I suppose, she did a voice for Family Guy this year, so people who don't know her have heard her. Give a whistle in her honor if you know how. Williams was doing lines with John Belushi the day Belushi overdosed in 1982, and said afterwards that Belushi's death helped scare him straight. Williams's proximity to that tragedy had a "there but for the grace ..." quality at a time when it seemed that any of the really funny men might go at any time. Williams's antics on the Mork and Mindy show only hinted at the mania to be seen in his standup act. The term "off the wall" seemed to have been coined for him, and it carried a sense of danger. His stream of consciousness always threatened to crest over the banks. But his greatest stardom in movies came after he had more or less sobered up. For most of the Eighties, starting with Robert Altman's Popeye, his work in film was hit or miss, the highlights including The World According to Garp and Moscow on the Hudson. For most of the Nineties he hit more consistently, really beginning with his inspirational-teacher turn in Dead Poets Society. By mid-decade he had reached the height of his stardom. Amid his massive, crowd-pleasing hits a more formidable character actor also emerged, a darker figure who projected genuine malice in small doses in the likes of Dead Again and The Secret Agent and then most prominently in Christopher Nolan's Insomnia. He won an Oscar by splitting the difference and lending gravitas to Good Will Hunting. The qualities he revealed in such roles kept him working when the masses suddenly decided, around the time of Bicentennial Man, that he was too desperate to entertain them. His filmography in the new millennium was far more modest, until finally he returned to series television last fall, only to have The Crazy Ones fail after one season. He apparently killed himself today, but he is no more gone yet than Philip Seymour Hoffman -- or for that matter, Mickey Rooney, who joins Williams in the forthcoming Night at the Museum sequel this Christmas, while Williams stars in something titled Merry Friggin' Christmas, which may now get a wider release than it would have otherwise. It's probably wrong to say that the demons of Williams's youth finally caught up with him, since he had been clinically depressed recently. Instead, there's actually something bittersweet in the fact that he survived and even thrived long enough that we're surprised to learn of his death. That in itself is some sort of success. In the Pre-Code era, you probably could have taken it for granted that a film called Virtue would be about a fallen woman. So it is in this Columbia release directed by Edward Buzzell and written by Frank Capra's frequent collaborator Robert Riskin. It's about the redemption of such a woman, a convicted prostitute played by Carole Lombard. I don't know if the picture is lost (while the soundtrack remains) or if Turner Classic Movies simply had a technical problem this morning, but the film opened in complete darkness as Mae (Lombard) gets a suspended sentence and is warned out of the state of New York. She gets a train ticket to Danbury but gets out in the big city, where she meets cute with cab driver Jimmy (Pat O'Brien), who boasts to roommate Frank (Ward Bond) that he's wise to women's ways. The joke is that he claims he can figure a female on sight but never guesses Mae's past until after he marries her. Jimmy simply isn't as hard-boiled as he pretends to be; his true sentiments come out when he confronts an unforgiving policeman: "The problem with you hard-boiled guys is when someone's on the level you can't see it." He assumes that Mae is on the level, and the film proves his instinct correct, until the cop sets him straight. Mae and Jimmy have come home from City Hall after an amusement-park honeymoon to find the cop sitting in Mae's apartment. What's Mae wanted for? Jimmy asks. "Same thing she's doing now," the cop answers, "Bringing guys up to her room at night." Jimmy is stunned and humiliated but steps up to admit his marriage, which saves Mae from being taken away for a parole violation. After the cop leaves, Mae pleads for understanding, but Jimmy slaps her and storms out the door. This scene is Pre-Code to the core. This grim little story gets a happy ending, if only because Toots proves an even bigger sap than Jimmy as Lil saves Jimmy from a bullet and tricks Toots into putting himself in the law's hands by promising that alibi. They call it Virtue but it could just as easily have been Men Are Dumb. The stupidity of the male characters -- it's probably no accident that Ward Bond has one of his bigger roles of the period here -- edges the potential tragedy toward the farcical as Jimmy infers far too much from the shadow play in the window, while for some sort of gangster Toots seems to lack basic survival skills. I guess that makes this a women's picture, albeit one with that special Pre-Code emphasis on survival at all costs and little apology for Mae's past. Like many Columbia Pre-Codes it looks great in restored form, thanks much to Joe Walker's cinematography. His work reminds me of one difference between Pre-Code and film noir. The earlier films are often as dark as the later ones, but noir is about the play of shadows while Pre-Code is often just plain dark, with luminous figures briefly illuminating the default darkness. The scene with the silhouettes in the window is a little silly but the way Walker films it, with streams of rain running down the window, is almost magical. As for the actors, Carole Lombard didn't really come into her own until the screwball era, but she makes a compelling, sympathetic heroine, while Pat O'Brien definitely makes a convincing sap while remaining likable enough, barely, for us to forgive him. It's definitely the sort of film they weren't making anymore for a long time afterward, and it's good enough, if no classic, to help you appreciate what Hollywood sacrificed to save itself. Having hit big by importing British author C. S. Forester and Horatio Hornblower to the U.S., Argosy gives its cover to another British author. At least it may be the first American publication of this author under this particular pseudonym. E. C. Vivian was a veteran author under several names; under the name Jack Mann he began publishing the occult adventures of one Gregory George Gordon Green -- nicknamed "Gees" and presumably pronounced "jeez," -- in 1936. The Ninth Life is the sixth Gees adventure but the first for Argosy. In it, Gees deals with a vamp (in the Theda Bara, not Bela Lugosi sense) who may well be an immortal priestess of Ancient Egypt. The new serial gets the royal treatment of a full-page illustration by someone other than the regular Argosy artist, and the editorial pitch makes it all sound enticingly exotic, but I confess to finding Mann's story and writing pretty dull. Charles Rice McDonnell's The Ringer and Theodore Roscoe's Mother Damnation continue this week, but I found the stand-alone stories more entertaining. Best of the lot is the latest No-Shirt McGee story from Frank Richardson Pierce. In "McGee on Horseback" No-Shirt and his sidekick Bulldozer Craig capture a wild horse and our sourdough hero gets the wild idea of taking the animal down to California to run in big-money stakes races. The fun thing about the story is how it turns on a dime, No-Shirt and Bulldozer abandoning the racing idea to sell a herd of horses to stampeders rushing to the latest gold strike, yet ultimately racing their top animals against some hustlers working the gold camps with a ringer horse. As an added complication one of No-Shirt's cousins, a professional jockey, turns up but is working for the hustlers. Pierce's colloquial present-tense narrative style adds to a sense of spontaneity not often seen in the pulps. Effective as an action story and interesting as a cultural artifact is E. Hoffman Price's "One Step From Hell." It's set in the American-ruled Philippines, where two years before the Japanese invasion and forty years after the U.S. takeover, American troops still have to deal with hostile Moro bandits (or insurgents) in the back country. The soldier protagonist reluctantly takes a mission to rescue a renegade American "sunshiner" from being tortured to death by the tribesmen. Gin Mike deserves whatever the Moros want to dish out, the soldiers understand, but they can't allow a white man to be killed by the natives, or else the Americans as a whole will lose face. "Lieutenant, it is prestige, and nothing else, that makes it possible for a handful of white men to keep a semblance of order in the Islands. [a commander explains] Once we lose face, we're finished out here. You're not going out to save Gin Mike.You're going out to maintain a tradition." Gin Mike "used to be white" in the hero's opinion, and he recovers some of his "whiteness" as he and the hero make their break. The grim irony of the story is that, as Mike seems to redeem himself, he's killed in cold blood by another white man with whom he'd been feuding. "I guess everybody's face is saved," the hero concludes cynically to close this tale from a forgotten period of American colonialism. Robert Cochran's "Tonight We March" is more like what we'd expect from pulp a few years later, during World War II. A downed American mercenary flier in China is escorted to safety by a brave band of guerrilla fighters, whom he mistakes for bandits, led by a woman nicknamed "White Dove." There's a faint hint of interracial romance as she and he pretend to be husband and wife (he pays alimony to an ex in the States) to trick the Japanese. But the main point is that "China will never die," even though a little American help certainly won't hurt, either. Finally, Richard Sale contributes "Hear Them Whistles Blowing!" a throwaway weird tale of the railroad in which the protagonist, stuck on an out-of-control train with a dead conductor and a broken ankle, seems to see the ghost of Casey Jones coming to his rescue. Next week the serials continue and a crew of sailors battle seal poachers and a submarine in the Arctic Ocean. For some movie buffs, "Once upon a time" has come to denote a certain mode of cinematic narrative in which a scene is protracted through prosaic action and dialogue to maximize success by exploiting our expectation that something will or should happen in the scene. Yet for the original Italian audience for Sergio Leone's fourth western, C'era Una Volta would most likely have been a reminder of Francesco Rosi's unlikely fairy tale romance of that name, the Sophia Loren vehicle known in the U.S. as More Than a Miracle, that was released a year before C'era Una Volta il West. Call it that or Once Upon a Time, and audiences around the world would expect a kind of western fairy tale. Appropriately, the film has a heroine. If not a princess, Jill (Claudia Cardinale) is the heir to an empire in the making. She is courted, so to speak, by three suitors. Of course, the film has no fairy tale ending; Jill may well live happily ever after as the matriarch of the Sweetwater station, but she has no consort. That's all for the best, since Leone's film could just as easily have been called Beauty and Three Beasts. None of the three becomes a prince because this is, after all, a western of the 1960s and the convergence of Leone's spaghetti style and the elegiac preoccupations of many American westerns. Not opening in the U.S. until 1969, it played against The Wild Bunch in some markets. Jill's suitors are of a doomed breed, the "ancient race" of men who live by force, by taking. These men objectify everything and everyone around them. That's true as much for the avenger "Harmonica" (Charles Bronson) as for his enemy Frank (Henry Fonda). They live by taking (even if Harmonica only takes revenge), not by buying, which is the way of the future that Frank flirts with and flinches from after getting burned when money turns his own men against him. More nearly human than the killer and the avenger is the bandit Cheyenne (Jason Robards). While Frank prefers to forget his past until the point of dying, driven forward by ambition, and Harmonica's past can be collapsed into a single moment that motivates his whole life, Cheyenne is capable of nostalgia, of sentiment in general. This makes him seem childish sometimes compared to his peers, but it also makes him the nearest thing to an ideal mate for Jill, with circumstance alone, arguably, preventing that happy ending. Cheyenne seems more self-aware and simultaneously more conscious of others than his peers; he can say of himself that he's not the right man for Jill, even as he warns that Harmonica isn't that man, either. Cheyenne isn't as bright as his peers, though he may have more cunning; he has a hard time grasping that the land of Sweetwater is the treasure rather than some hidden stash of gold until Harmonica spells it out for him.Yet Cheyenne seems to see what's coming, what the future will be like and what it requires of people, in a way beyond the comprehension of fanatics like Frank and Harmonica, who seem to see their successors as inferior beings. Cheyenne's advice to Jill has been condemned since his words were first heard on screen, but if we generalize beyond the character's sexist rhetoric we may get to the real point. Don't begrudge working men the occasional pat of your rear, he says; "pretend that it's nothing. They've earned it." We can dispute whether they've earned that, exactly, but what Cheyenne may be saying, what Bernardo Bertolucci and Dario Argento are trying to say alongside Leone, and through the vehicle of Sergio Donati (in Italian) and Mickey Knox (in English), is that while the mighty men of Cheyenne's doomed generation lived by taking, the world Jill inherits will flourish not through buying, but through giving. Well, I had to come up with something for the occasion of seeing Leone's epic on the big screen at the Madison Theater in Albany. I still like The Good, the Bad and the Ugly better, but it's very close between these giant films, and it's arguably a competition between an apple and an orange. Once Upon a Time in the West is more self-consciously a work of art on every level, and it's also the climax of an epic decade in which Italy mounted an almost plausible challenge to America's global cinematic dominance. The Italians cracked the American market on all levels, from the arthouse to the drive-in, with everything from Antonioni, at one extreme of pretension, to Hercules movies. Leone and his peers escalated the campaign by appropriating America's defining cinematic genre, and filming in Monument Valley Leone dramatically planted the Italian flag at the heart of American cinema. West is more of an all-out Italian effort than Leone's Dollars films. Conceived by that mind-blasting trinity of Leone, Bertolucci and Argento, it's a masterpiece of Cinecitta production design and probably the most eloquently versatile use of wood ever in movies. You can't fully appreciate that aspect of it until you see it at the right size. Throw a star Italian actress into the mix and it seems even more like the national epic of Italy's battle for cinematic mastery. Maybe Americans recognized this and were repelled by it after embracing the Dollars films. Why West bombed here remains a mystery; Paramount's fatal excision of more than twenty minutes was a decision of panic while the film was already failing. Did people miss Clint Eastwood? I don't think that was the problem, and I honestly can't see Eastwood as Harmonica -- the Man With No Name never seems that zealous about anything. Pace rather than length seems to have been the main problem, since West was always shorter than The Good, the Bad and the Ugly, yet always seems longer. West is simply more complex; while GB&U has to converge only two tracks, Angel Eyes on one, Blondie and Tuco on the other, West opens with two enigmatic bursts of violence, introducing one major character apiece, and then takes its sweet time linking these events to the destinies of four (or five, counting Gabriele Ferzetti's train magnate) major characters. It makes sense once all the pieces are in place, but there are moments when it seems as if Leone is having (or teasing) difficulty fitting them together. Some scenes in "once upon a time" mode, most notably the first scene at Lionel Stander's trading post, seem unjustified by the potential for action; Jill is only a bystander as Cheyenne and Harmonica first meet one another, and neither notices her, each meeting her in Sweetwater later as if for the first time, and while the scene reveals how Frank has tried to frame Cheyenne for his recent crimes, the revelation has a throwaway quality -- and it seems odd in retrospect that Frank and Cheyenne never actually meet each other. While GB&U is a fast engine on a meandering track, there are moments in West where the first-time viewer may legitimately wonder not just when the train will get where it's going, but where it's going in the first place. It's more of a loose baggy monster than GB&U, but on a frame-by-frame basis it's more spectacular, and cumulatively, prodded forward by Ennio Morricone's beloved score, it's a more emotionally moving experience. In ways intended and unintended it marks the end of an epic era, and it is hard not to feel sad to see it end, even if what you feel is that good kind of moviegoing sadness tinged with wonder. It may have been a fairy tale, but some of the magic was real. In this world there are two kinds of antiwar movies: pacifist movies, and Sergio Leone's epic conclusion to his Clint Eastwood "Dollars" trilogy, which is no less antiwar for its reveling in man-to-man gunplay. There are moments in its three hours when each of the principal characters -- not just Eastwood's "Good" gunman and the late Eli Wallach's immortal Tuco, but also Lee Van Cleef's villain Angel Eyes -- registers dismay or disgust at the scale of destruction and carnage generated by the American Civil War. The U.S. advertising claimed that the War was just "practice" for these three, but the characters themselves might disagree. They are all violent, ruthless and greedy men, but war is beyond their comprehension. They see no point to it. Personal gain is the only justification for killing they can imagine. Tuco brags that he has a $3,000 price on his head and speculates that the Union Army "didn't even pay you a dollar" for a soldier's amputated arm. In this respect the Good (a con man who abandons his partner in the desert after calculating diminishing returns) isn't very different from the nearly amoral heroes of American westerns, not to mention some American war movies, but the typical American story has the hero redeem himself by making a larger cause his own. Joining the war completes a moral awakening in these cases. In the Leone film Tuco and Blondie (Eastwood) intervene in the war only to get it out of their way. If they can blow up a much fought-over bridge, the contending armies will disappear so they can cross the river unchallenged. On Blondie's part, if not on Tuco's, the gesture is also something of an act of compassion toward the drunken captain who had befriended them before getting mortally wounded and had fantasized about blowing the bridge despite orders to capture it intact. What makes Blondie the "Good," I suppose is this awakening of compassion, which extends to another mortally wounded soldier to whom he offers his coat and cheroot. Significantly, Blondie finds a serape near this victim and takes it for himself, transforming himself into the Man With No Name we remember from the previous Leone films. But Blondie's compassion extends only to those who have to fight for no good reason, as far as he can see. There is no sharing the treasure of the stolen payroll with Angel Eyes; Blondie will "earn" it by killing the Bad one -- who perhaps best displays his Badness through his easy infiltration of the Army as a prison officer waiting for the mysterious Bill Carson to fall into his lap. And while Blondie ultimately does share with Tuco, he can't resist teasing his sometime-partner in their typically vicious fashion, leaving him with only a wobbly tombstone standing between him and a hanging until the Good one reminds the Ugly of his marksmanship, shooting the rope apart in time for old time's sake. Maybe what makes the Good good is that he'll kill only with "good" reason -- the sort of reason a state can't have. The message to the rest of us might be: kill, or risk your life, only if you get something out of it. This may be the ultimate statement of the amorality often thought to define spaghetti westerns. Leone himself would move on to a straightforward revenge story with an unambiguous hero, and then to a "Zapata" western with nearly the opposite message from GB&U, focusing on the radicalization of a Tuco-like bandit and his adoption of a higher cause. It may be significant that Duck You Sucker is easily Leone's worst western, that he was following the politicization of the genre (at least when set in Mexico) without really feeling it. He seems more comfortable with the scale of GB&U, in which the protagonists resist politicization and the petty feud between Blondie and Tuco so fascinates him that more than an hour goes by before the plot of the picture really gets going. This is where Leone begins messing with audiences by slowing things down. Angel Eyes's early visit with a doomed soldier, when he sits down to share the man's dinner and we see him devour every spoonful, is in the director's protracted "Once Upon a Time" mode. At other points, most notably Tuco's famous race through the cemetery, Leone seems to stretch the scene to suit Ennio Morricone's music. Either way, length creates atmosphere and manipulates mood. If there's an objective standard to apply, GB&U is really too long, especially with the restored scenes redubbed by an elderly Eastwood and Wallach and a bad Van Cleef impersonator. But maybe you can't cut footage (apart from what had been cut for the initial U.S. release) without cutting from the film's distinctive character. More than Leone's masterpiece, this is Eli Wallach's monument. With Eastwood trapped in the Good role (and unable yet to act his way out of the trap) and Van Cleef much diminished from his star-making turn in Leone's previous film, GB&U is Tuco's show. What makes Tuco Ugly, apart from his obvious physical shortcomings? Why is he a Rat while Blondie is a Pig? It's hard to judge one man the moral superior of the other; they backstab one another with equal relish at every opportunity. We turn to Angel Eyes for some clarification: Tuco is no less tough, but less smart than Blondie. How smart is Tuco? On one hand, he can barely sound out the word "unknown" on a tombstone. Yet in the "Ecstasy of Gold" sequence he races through the cemetery at such speed that the audience registers the tombstones as a pure blur, yet Tuco is obviously processing all the names at some superhuman rate until he finds Arch Stanton. Both Blondie and Angel Eyes see Tuco as an idiot -- Angel sees both his antagonists that way, despite his compliment to Blondie's intelligence -- but Tuco has the film's most famous moment of common sense: "When you draw a gun, shoot, don't talk." Tuco bears the brunt of the film's slapstick, though he gets some revenge on Blondie in the desert, but he's also the nearest to a sympathetic character of the three principals, the one with the most backstory and a hint of pathos in his past. We can root for Blondie but Leone seems to want us to feel for Tuco. Yet Blondie is the character most capable of feeling for others, even if he's not very capable. Tuco lacks compassion; finding Blondie doing their old con with a new partner, he takes Blondie away at gunpoint and leaves Blondie's new partner to hang. Blondie himself doesn't seem too torn up about it, but he has his own problems at that moment and the partner was new. But Blondie seems to learn compassion along the way while Tuco doesn't. Even so, Blondie is probably always too cool (rather than good) for us to care much for, while to the end we empathize with Tuco and maybe echo his closing opinion that Blondie is still a no-good son of a AHHH-AHHHHH-AHHH!!! And maybe that's how Leone had come to feel about the Eastwood character after three films, and maybe Eastwood realized that and, seeing diminishing returns, abandoned Leone for Hollywood and ultimate auteurship in his own right. This may still be a "Man With No Name" movie, but above all it's the one with Tuco, and it was good to see it on a big screen at the Madison Theater in Albany this weekend, with Eli Wallach's performance appropriately larger than life.